Lincoln band Knock Out Kaine may not be on the front cover of magazines in Britain, but they’ve stirred up a reputation in Europe. The hard-rocking four-piece are based in the city and have achieved most of their success overseas. Taking inspiration from classic bands like Guns n Roses, they’ve toured the likes of Italy, Sweden and the USA. In the UK, they’ve played Download Festival and been featured in Kerrang! magazine. The Lincolnite sat down with frontman Dean Foxx and bassist Lee Byrne to discuss how staying focused and keeping an eye on the audiences overseas can help you chase your dreams. Tell us about your style and influences. Dean Foxx (DF): It’s hard rock. There’s a lot of influences on different songs. A lot of reviews we’ve had have picked out different styles. There’s definitely that early 80s to early 90s rock strand, that drives it, without a shadow of a doubt. There’s punk in there, there’s jazz and a lot of country music influences. We love artists like Steve Earle and Johnny Cash. Hardly any of Lincoln’s bands make it out into the rest of the world, how did you do it? Lee Byrne (LB): We’ve been through some hard times. In 2010, we went through bad times; break-ups, band members leaving and big companies promising us the world and not delivering. Then there was this one gig we played in Shoreditch, London. We were approached by someone and I remember thinking he was full of rubbish. DF: Then all this money appeared. We got taken to meets and wined and dined. LB: Within a week, everything had been sorted out. You’ve since toured Europe with members of Guns n Roses. Do you have any road stories? LB: I punched [Guns ‘n’ Roses drummer] Steven Adler in the groin. I was really drunk and our guitarist, Jim, was trying to put a carrot down my pants. I’d lost my sense of left and right and I got mixed up. I thought Jim was on my left but he wasn’t. I punched Steven three times. It was the fourth show of a 22-date tour and he did not say one thing about it for the rest of the tour. The next time I saw him was in Amsterdam, at a square and he said he was alright. He gave me a hug. DF: Our official album release in the United States was at the beginning of August. It’s now on rotation on 60 different radio stations but the record is going out to more people. We’re told that in the next few months, it will be going out on up to 7,500 radio stations. I didn’t even know there was that many. We’ll be going out to the states sooner than we thought. Could we see an Engine Shed performance? DF: I think we’d struggle at the moment but I don’t think in a year’s time it would be out of the bounds of reality. We know that the record is going to shift quicker in other provinces than it is in the UK. The UK music industry is a closed shop. LB: The fact that our record label is German says it all. There’s only a few venues in the UK that have treated us properly. Most venues in Europe gave us free beer and treated us like kings. 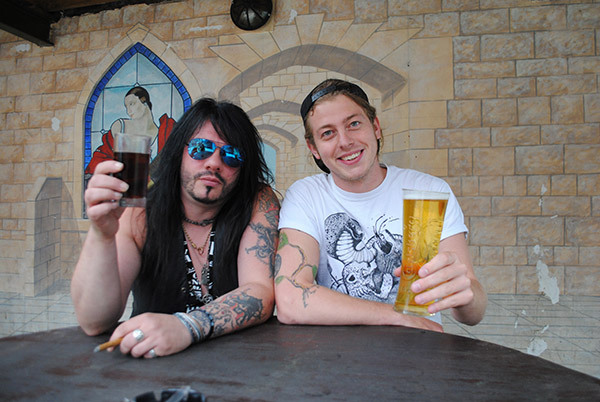 We played in Ipswich and I went up to the bar and asked for half a coke. The bloke asked me for 2 quid. Dean put his arm round me and said ‘welcome home’. So what advice would you give to other bands in Lincoln, looking to make it? DF: A friend of mine, who is a session musician, said to me that perseverance is the common denominator in any success story because everyone bails out just before they get their big break. If you keep moving between different things, the chances are, it’s never going to happen.